Our Philosophy: To benefit our customers and community by always doing what is right for them and the environment. 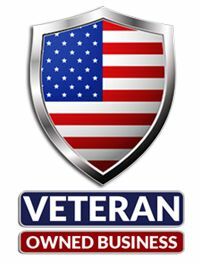 We are Veteran Owned and Veteran Operated! We helped protect our country, now let us help protect your data! At Sensible Recycling our philosophy is built around our core values of Honesty, Integrity, and Commitment. We are always willing to go the extra mile for our customers. We realize that we provide a service and without our customers, we would not exist. Technology is always advancing, making what is new today old and obsolete tomorrow. As your components become obsolete and are replaced, we strive to provide you with a high level of customer service based on our core values. We want you to feel secure in the fact that your important electronic data will be destroyed in compliance with all Federal, State, and industry standards. Rest assured that your computers and electronics will never find their way into a landfill and will always be recycled responsibly. Sensible Recycling is unique in that we offer to pick up, electronic data destruction, and computer and electronics recycling services all at no charge. 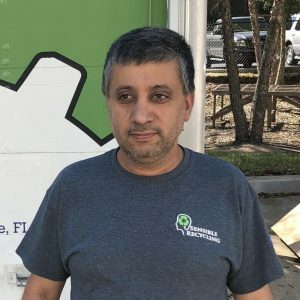 We make our living by dismantling and recycling the computers and electronics we receive from our customers. All components are recycled responsibly and will never be disposed of in a landfill. All components given to us that may contain any data will be shredded ensuring that the data can never be recovered. Sensible Recycling was founded in 2016 by Aaron Enos. 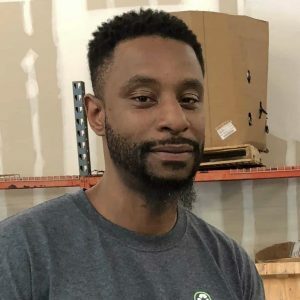 As an avionics technician in the United States Navy, Aaron worked on everything from radars to radios as a technician on the P-3 Orion anti-submarine aircraft. 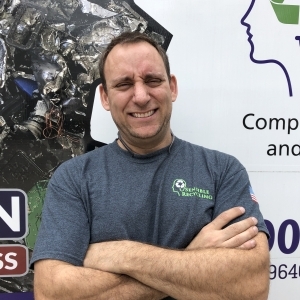 Aaron has spent the majority of his career since the military in the metal recycling industry. 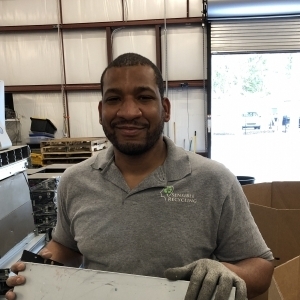 He is now bringing his passion and knowledge to electronics recycling and strives to change the industry with no cost, secure electronics recycling model. 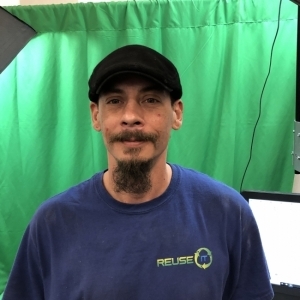 After 26 years of Air Force service, Joe began his role at Sensible Recycling in Operations, using his expertise in military installations, electronic/telephone/radio communication and logistics. His experience both abroad and at home has brought a breadth of talent that continues through sensible electronic recycling. 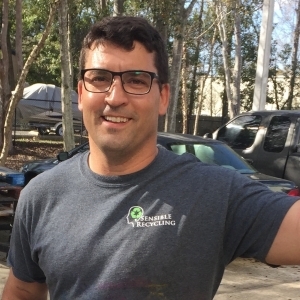 Joe is also a community volunteer, working with children with special needs as well as an active member of Assumption Parish in Jacksonville. Joe enjoys puppies, cooking and long Sunday walks on the beach with his wife. Moose is ex-Navy. He is a Jacksonville Native and loves the area. His background is in machining and casting. He enjoys sports and video games. Muhsin is ex-Iraqi Army. He has lived in Florida for 21 years. He has a background in small electronics repair and engine repair. Muhsin enjoys boating, fishing, and painting. Mike is our Operations Manager. He is not a Vet, but the way he works you would never know. The bulk of his experience comes from the restaurant industry whereas a chef, he managed kitchens and cooked up some good grub. 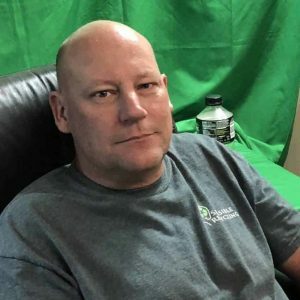 He enjoys playing music and spending time with his wife and two children when we aren’t driving him crazy at work. Kenny is a Marine. We don’t hold that against him though since the Marines are really part of the Navy. Kenny is working with us while he attends the University of North Florida full time. Rob is our retail sales guy. He has a background in computer repair and programming. He loves electronics and eating. (How do skinny guys eat so much and not gain? It’s not fair!) He does a lot of eating in between selling.